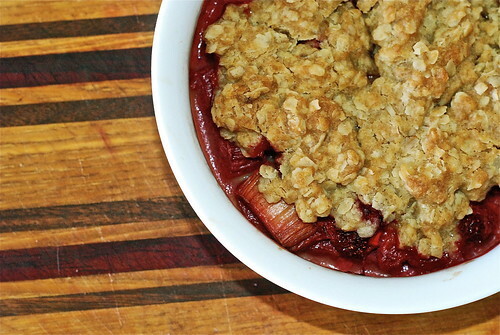 This entry was posted in Waste less recipes and tagged Cooking spray, food, food waste, keeping strawberries fresh, recipes, Rhubarb, Rolled oats, strawberry rhubarb crisp, sustainability, sustainable living, tip, vinegar by Jean-François. Bookmark the permalink. They really were a couple of cuts above the norm … and I hear you about the fuzz. 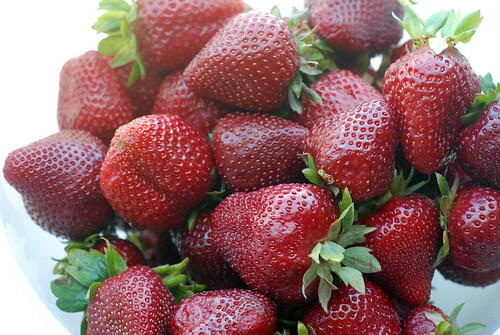 A strawberry is a terrible thing to waste. Mm…lovely treat. Our strawberry-picking is finished. I think we’ll go tomorrow for a 1.5 hour drive to pick a year’s worth of blueberries (for the freezer) before the season ends. Hope your jet lag is over soon! Thanks. All better now, and not scheduled to be jet lagged again for a couple of weeks. Enjoy the blueberry picking. We missed it. Gonna try again later this week. I bought some store blueberries (my first since my bushes quit producing). YUCK! Well, maybe they’re OK to eat…but nowhere near as sweet and tangy — like a berry should be. The cultivated berries are bred to survive shipping, not for flavor, methinks. Question: does soaking the berries in vinegar change their taste? No – once they dry off, they taste just fine. If you want to remove all traces of vinegar, you can always rinse them in water after their vinegar bath.